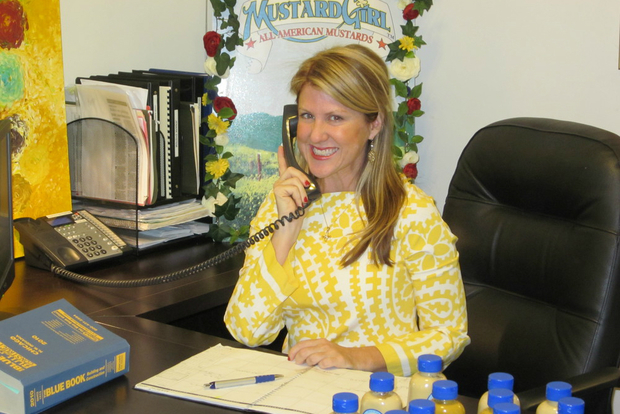 Jennifer Connor is Mustard Girl ... and her Lincoln Park business is booming. LINCOLN PARK — Everyone knows the sausage king of Chicago. But it's possible Chicago's very own queen of mustard becomes a household name very soon. Jennifer Connor is Mustard Girl. 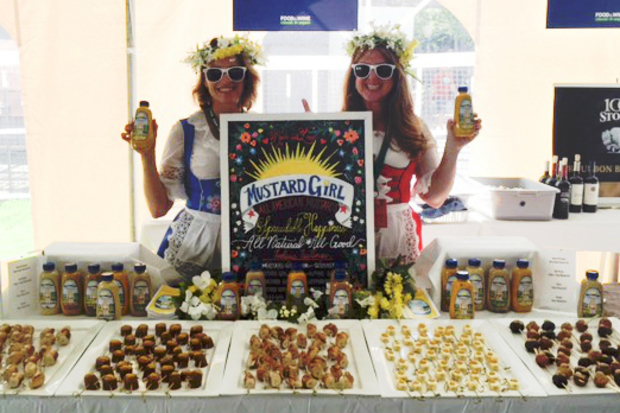 "I couldn't imagine a world without these mustards," said Connor, founder and namesake of Lincoln Park-based Mustard Girl American Mustards. Connor, who is in her late 30s, said she believes in the power of mustard more than most people believe in a higher power. The company, which is celebrating its seventh year in business, is booming, and recently signed a deal to supply the U.S. armed forces with mustard. The mustard can also be found in the city's top restaurants, including the Virgin Hotel in the Loop, numerous Lettuce Entertain You restaurants, Tavern on Rush and Publican Quality Meats. And it's sold in local grocers, including Whole Foods and Target. Connor, who is pretty much a one-woman band as Mustard Girl, even delivers to many of her customers. "It's not like Swiss Miss or the Pillsbury Doughboy. It's a real person," Connor said. "It's important to keep the beat on the street." The label slapped on all five varieties of mustard features a drawing of Connor wearing a traditional German dirndl, which she wears regularly in real life. The story of Mustard Girl's creation dates back to Connor's college years at the University of Wisconsin, where she first tasted Wisconsin-based farmer Dave Rendall's mustard at a supper club. "When I tried it, it was like the Fourth of July on my taste buds," Connor said. "It literally made me happy. Whenever I was having a bad day, I would go taste the mustard. It was like a miracle mustard." When Rendall decided to retire, Connor contacted him and asked to buy his secret mustard recipes. At first, the mustard farmer said no, and Connor told him she was going to take a week to figure out a plan. "I said 'the world is a tough place as it is. I can't imagine a world without your mustard,'" Connor said. Connor ended up driving north from Madison toward her family's cabin looking for a sign. "Like the Blues Brothers on a mission from God," she said. "I just headed north looking for a rainbow or shooting star, just looking for this sign." The young Mustard Girl went to church as a "last resort." It was her first time stepping foot in St. Leonard's in Leona, Wis., and the homily from the Rev. John Cerkas blew her mind, she said. The focus of the talk was the parable of the mustard seed. "I almost fell off my pew," Connor said. "I almost literally fainted, and this nice old lady next to me grabbed me." Cerkas, who is now retired, remembers that homily from nearly 10 years ago. Cerkas called it a "fluke" and doesn't want any credit for providing the sign that sparked the mustard business. "For me, looking for signs in that manner isn't something I would subscribe to myself," Cerkas said. "Most of what she does is hard work." Connor returned to Madison after her first time in a Catholic church, told the story to Rendall and walked away with the handwritten recipes on little yellow sheets of paper. 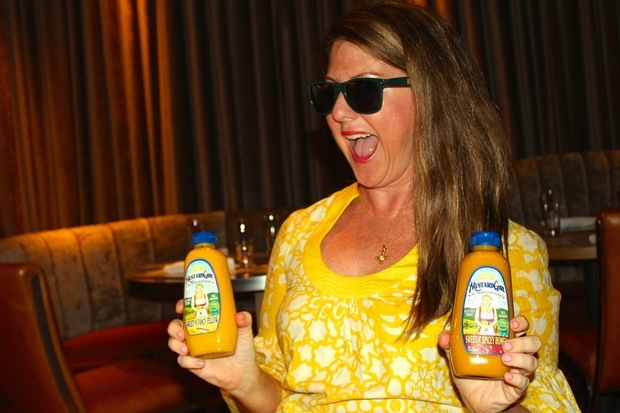 A sign or not, Mustard Girl is aiming to sell 1 million bottles this year. All of the mustards are still made in Wisconsin, are gluten-free and contain no preservatives or high fructose corn syrup. Despite the refusal to include additives or other artificial flavors, Connor is able to keep the mustards competitively priced with the mainstream mustards such as French's. Earlier this year she was invited to participate in the prestigious Food & Wine Classic in Aspen, Colo., where she and her cousin donned their dirndls. Connor has an entrepreneurial spirit ingrained in her. She started off selling lemonade as a child. "I've always loved the color yellow," Connor said. She also began experimenting in the kitchen, adding ingredients to the mustards in her family's refrigerator. After a few years in Hollywood chasing her dream of becoming an actress, Connor returned to her home state to finish the last year of her undergraduate studies at the University of Wisconsin-Madison. To fund that year she created a little company selling cowbells that quickly became a hit at Badger football and hockey games. Connor then sold more bells outside AC/DC concerts ("Hells Bells"), and made a killing at the Republican and Democratic national conventions in 2000 selling Bush Bells and Gore Gongs. Those can now be found in the Smithsonian Institution's political memorabilia collection. Really. "I was just really trying to find my way," Connor said. "I know in life if there's something you believe in and know you can do it, surround yourself with good people."